On April 15th and 16th, the cast and crew of this year's Upper School spring production, The Curious Savage, brought to life a tale of greed, family, friendship, and the true meaning of sanity. 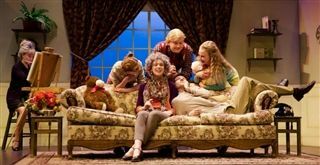 The talented cast expertly brought the play's colorful characters to life with humor and wit, the sets and costumes were well designed and playful, and audiences left each show throughly charmed by this memorable group of "savages." Thank you to Director Fredreka Irvine, and all the students and parents who helped make this production a success.